In 1972 I was 16 years old and bought two cars. 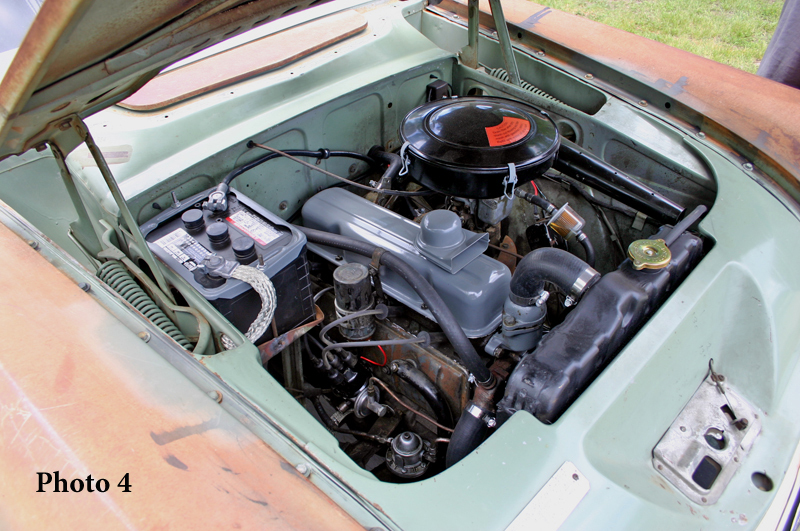 The 1947 Chevrolet coupe’s engine was dismantled and in pieces in the trunk. 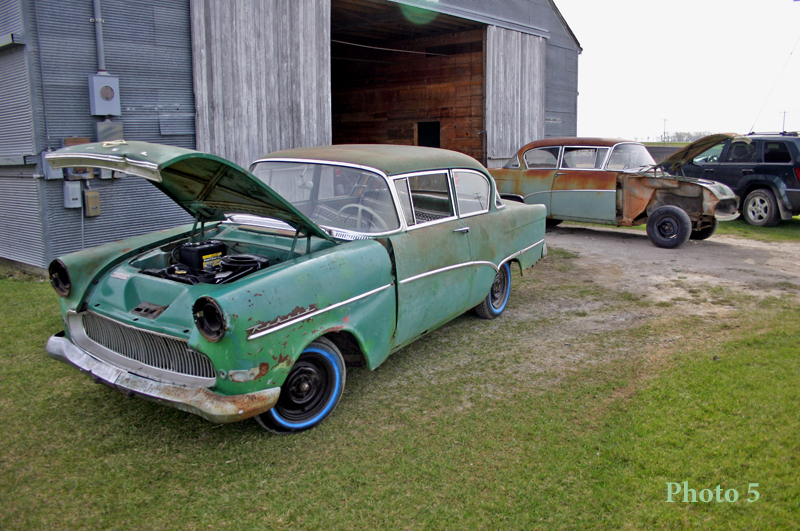 By the end of summer the Chevrolet was re-assembled and running. The other car was a 1959 Opel Rekord. 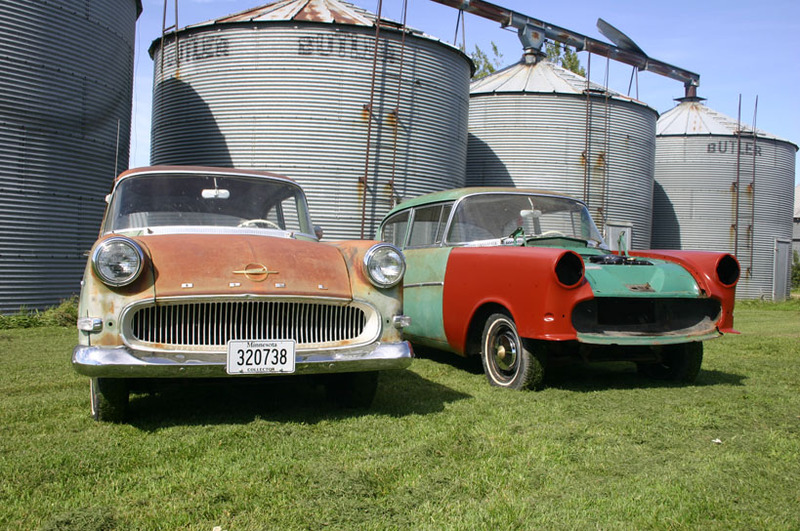 Yes, at that time ’58 and ’59 Opels were still on the road in the US, and somewhat common in Minnesota. The Opel I had just bought ran well, but had a bad generator. 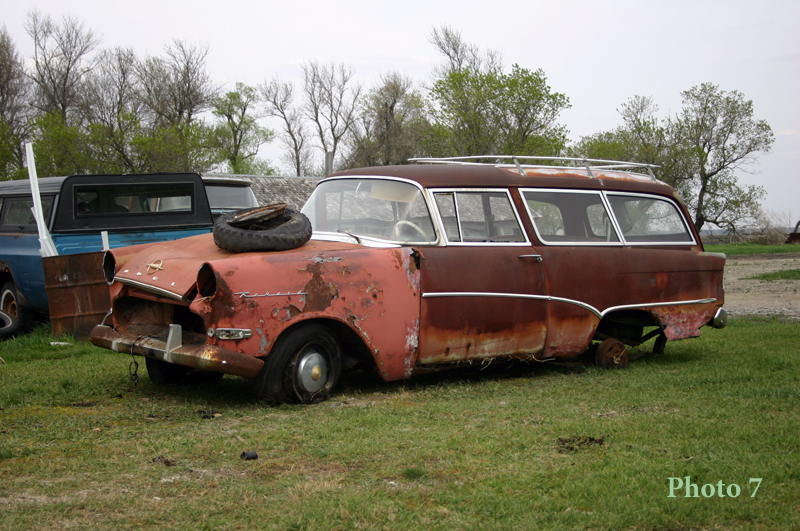 Luckily I had an Opel Caravan that my father had just quit driving because of rust. I was able to easily transfer the needed parts and soon had a drivable Opel. I have driven the Chevrolet weekly over the summer ever since, and I continued to use the Opel for another four years. The Opel went into a storage shed in ’76 and would be started occasionally, sometimes making a trip around the back yard. The intention was to paint the Opel and put it back on the road someday. Ten years ago a high school friend recalled the Opel sitting in storage. He offered to help get it out of storage and back in roadworthy condition. That spring I was busy with a new job and did not have time for another project. Fate soon stepped in; late April that year a grass fire got away from a farmer who was clearing land, and the shed, the Opel, and numerous tools were lost. I occasionally thought of the Opel, but devoted time to refining the coupe’s retro engine with fun things like dual carburetors and split exhaust. 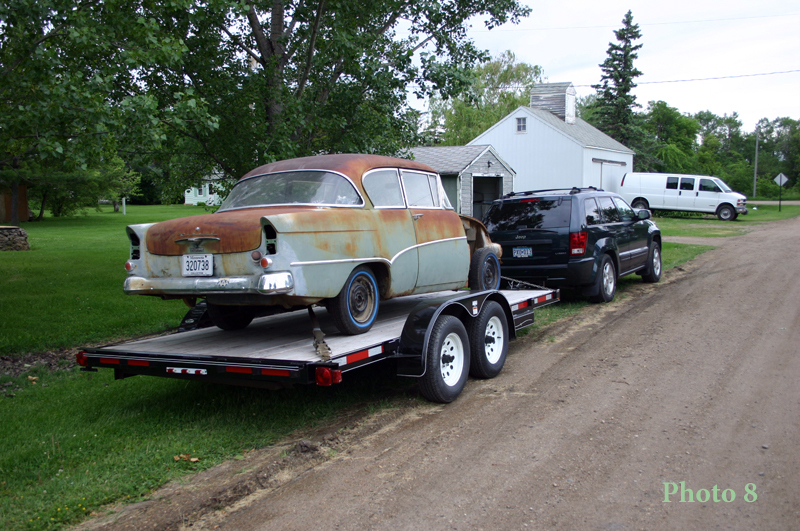 Last summer (2009) an Opel appeared on e-bay that was within driving, or should I say trailering, distance – and it ran. After some negotiation I had a running 1960 Rekord (P1) with marginal brakes and badly damaged front fenders. With no storage space at my home my friend offered space in his shop. However the 200-mile trip to this shop would present a challenge! A plan was devised – take the car apart in units that needed repair – box them up and bring them home. I’d work on these items for two or three weeks, then return to reassemble the fixed parts and take home more parts needing attention. This repair process continued over summer until the car ran, stopped and drove great. But after trying for several months I still did not have restorable front fenders. Late that fall another Opel appeared on e-bay – this one had fenders. In fact the entire body was a solid Arizona car. Great; fenders – bad 2,000 miles away! The Opel gods must have been smiling on me that day, after five or six phone calls I was talking with a trucker in Arizona who was headed back to Minnesota with a load of old cars – he had room for one more. Guess what, Opel number two, this one, a nearly identical 1957 model P1, was headed for my friend’s shop. 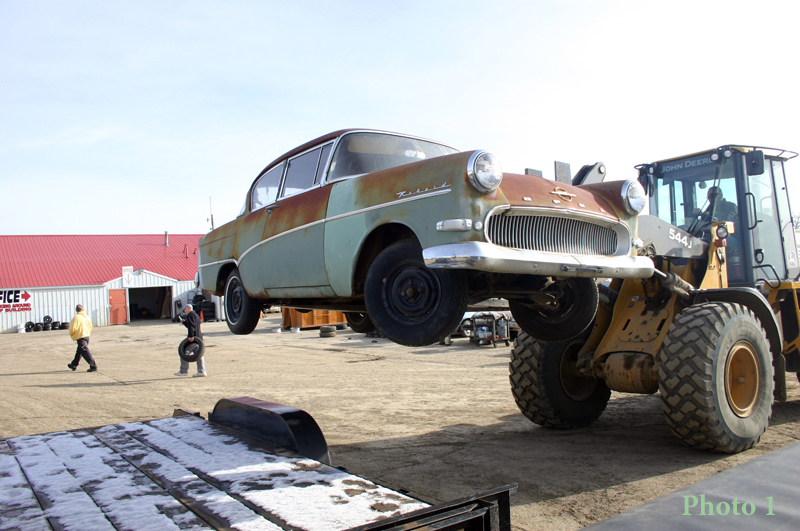 The car arrived at the French Lake salvage yard in late November. Clear, cold, and with fresh snow on the ground, it was not a great day to load a car on a trailer – or so I thought. I drove west from the Twin Cities; my friend headed sough with the trailer. 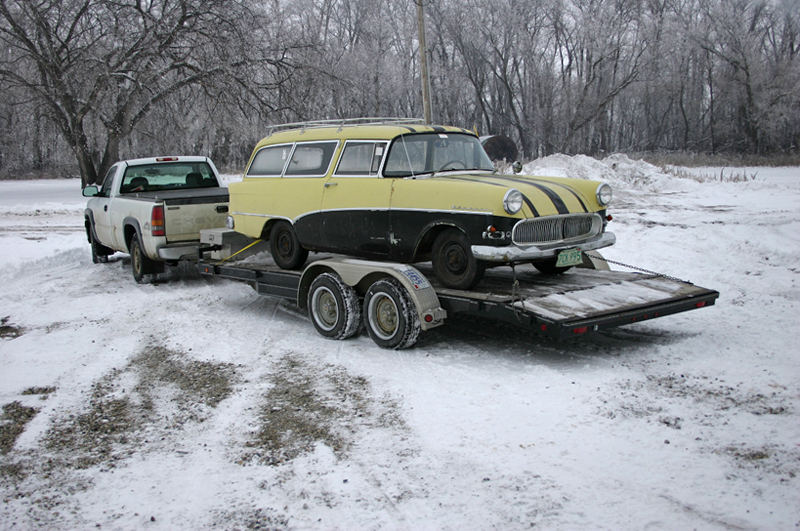 As I drove I devised all sorts of plans on how to start the car on this cold day and then load it on the trailer. Oh, by the way, this car had no brakes at all! These guys do it every day; but I was amazed when the forklift operator unloaded the Opel from the truck and placed it dead center on our trailer in less than a minute. Since the Arizona Opel had a good body and only 39,000 miles, the focus shifted to getting that car on the road first; same plan – one box of parts at a time – bolder goal. Since we had gotten the first car running with such an unorthodox approach confidence overwhelmed us. 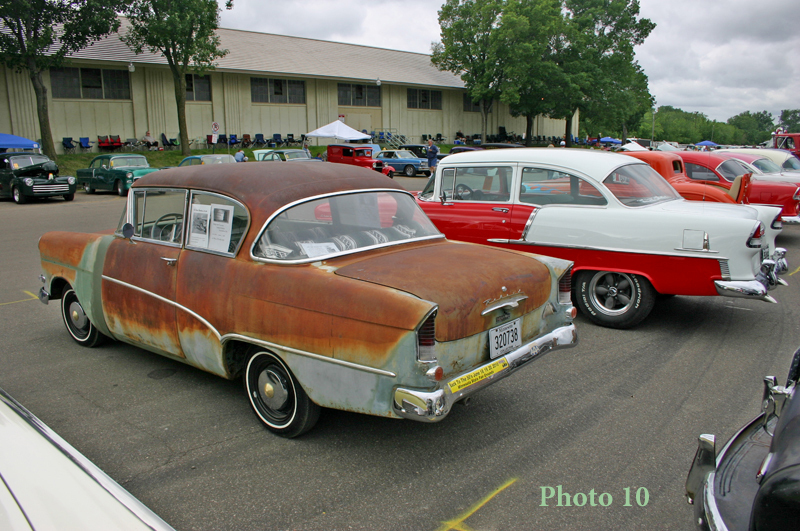 The new plan was to get the Arizona Opel running, stopping and drivable in time to take it to the Minnesota Street Rod Association’s Back to the 50’s car show in late June of the upcoming summer. Back to the 50’s is host to nearly 12,000 pre-‘64 cars; what a better place to reunite the Opel with its automotive brethren. E-bay searches netted replacement items like new taillight and turn signal lenses from Argentina, a shift linkage busing from the Netherlands, and miscellaneous brake parts from all across the US. Desert conditions are no kind to rubber or cloth parts. Half the electrical system – that part composed of cotton and rubber covered wire – had to be replaced; along with reupholstery of seats that were so dry rotted they crunched loudly when sat on. Starting in March, the one box at a time brigade of parts resumed their trips across the Minnesota prairie. 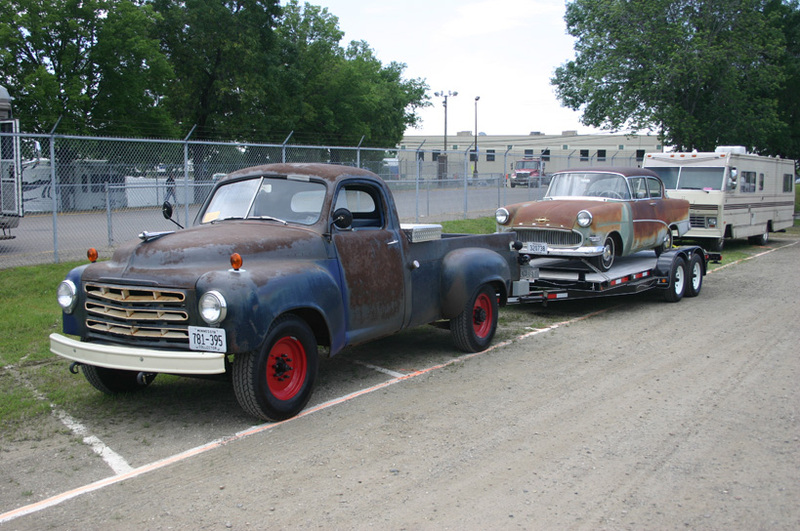 With new brakes and a running engine, the still partially disassembled Opel was driven onto a trailer in early June for the trip to my home where I’d put on the refining touches – like rust-proofed fenders, grill, and of course all the re-worked lights. Reassembly went well and the Opel made its first solo trip to a gas station in over thirty years on June 13 (2010). 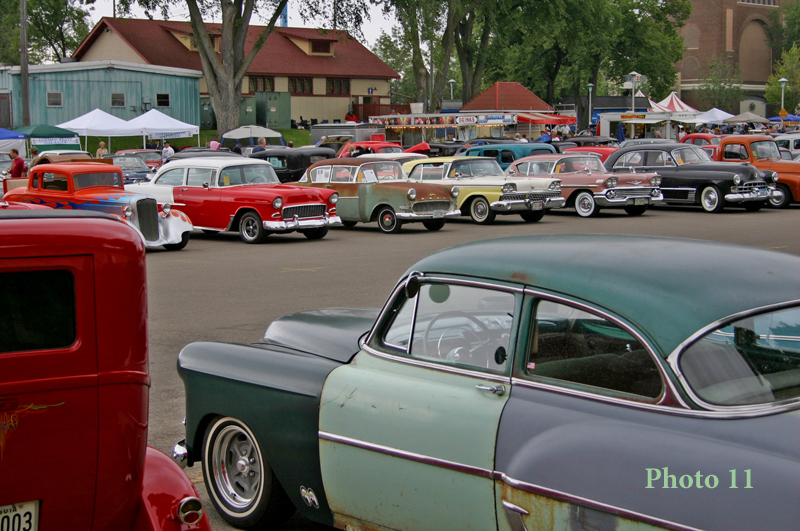 With less than a week to go to before the 50’s show all seemed good – except for that fuel pump issue. Anything over 40 mph resulted in hesitation, but with patience I could easily coax the car to 55. Bad diaphragm, weak spring, maybe even sticky check valves; I was confident this fuel issue could be overlooked until after the show. Back to the 50’s gets underway Friday. After a mandatory work meeting in the morning I was off the registration; driving the Chevy coupe. The plan was to loop by the show, pick up my friend, drive to my house, and then bring both cars back. Well, the Opel made it as far as the hardware store parking lot two miles away from my home; there it refused to run at anything faster than an idle. Coupe as parts car, I returned home and made another fuel pump out of my best spare parts. This pump sounded strong and should work well – well not. The car ran better, but still hesitated; and by now it was 4:00 pm of the first day of the show. I limped the Opel back to my shop and attempted to blow out the fuel like. Then I had a thought! What if I put something in the line, like dark colored penetrating oil, laid under the car, held my finger over the tank end of the line, while my friend applied air pressure to the line. Oops, a dark spot appeared on the line where it arches over the rear axel. A tiny pinhole, worn through by a body bracket, had prevented the engine from getting sufficient fuel. A foot of flex hose and two clamps resolved the issue. The car ran great – 55 mph all the way with no hesitation. We made it to the show by 7:00 pm on Friday; and now that the mechanical issues were resolved made several victory laps around the grounds on Saturday. Reactions to the Opel ran the entire gambit. 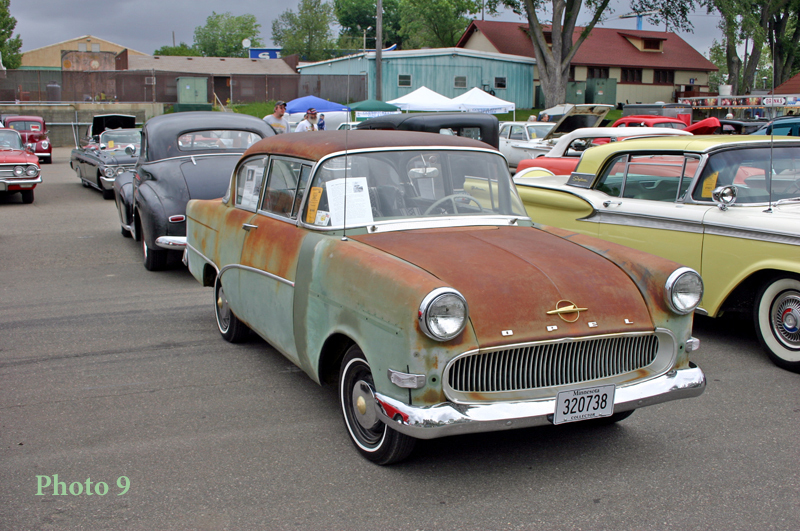 “What’s an Opel?” “Nice patina” – 50 years of desert sun is not kind on painted surfaced. Plus, there were the comments of several veterans who were stationed in Germany and recognized the car. I think I can safely say I had the only Opel at the show – however one gentleman told me he was working on something ever rarer, a Checz Skoda. Future plans do call for paint – yes patina fans this car’s sheet metal is so good I’ve got to seal it back up with shiny olive green paint. And, of course, I need to complete that upholstery job started earlier. As for the ‘60 Opel I had started this adventure with; the Thursday before the 50’s show two, rust and dent free fenders arrived from southern California. What now? 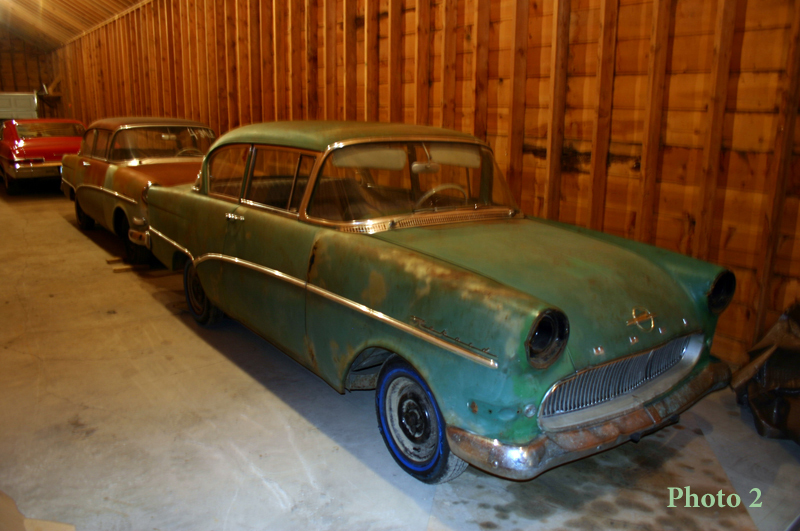 Well there are plans to make the ’60 into the only convertible Opel Rekord in the US…..but that’s another story. photo 13 '57 leaves the Back-to-the-50"s show on a trailer toed by my 51 Studebaker. 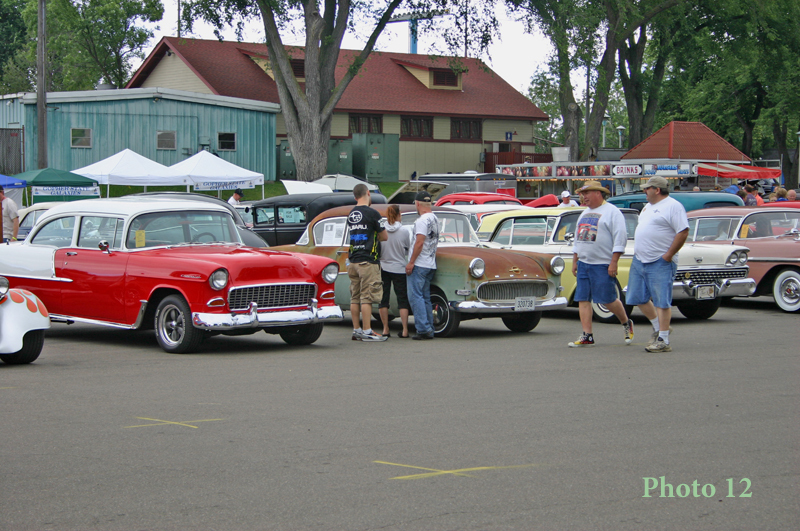 Photo 14 Over the summer the '57 appeared at four car shows and traveled over 300 miles. The '60 got a pair of good front fenders, a reupholstered seat, and a new water-pump. I am also attaching a photo of my latest find - my third P1 Opel that I bought last weekend. With the exception of missing hubcaps this is a complete car. The rocker panels are rusty and the car hasn't run since 1973. 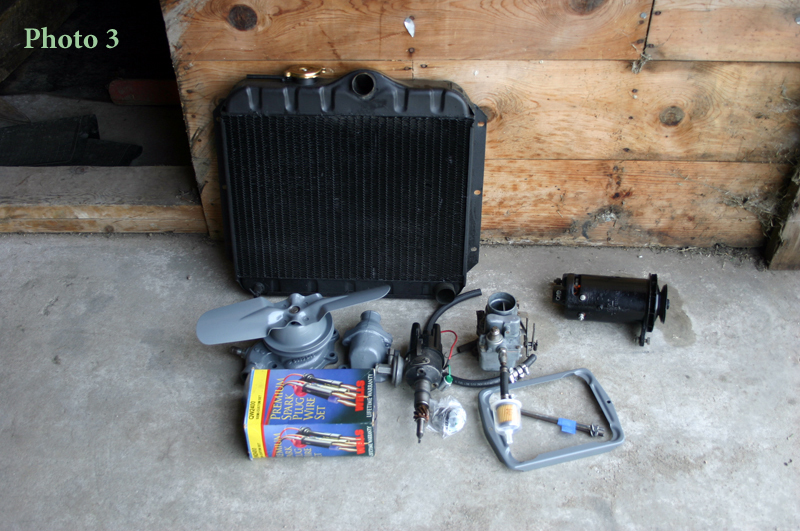 I will see if I can get it started once the snow melts - perhaps by next April !